FOUNDED in 1911 on the initiative of Conrad No?l, Vicar of Thaxted, as part of the reawakening of interest in Morris dancing begun by Cecil Sharp and others, Thaxted Morris is the oldest revival side in the country. One of the first public performances was for the local celebrations of the coronation of King George V. The 1920s saw meetings being organised between some of the Revival clubs. Thaxted were hosts in 1927 and, except for the war years, there has been a meeting every year since, the only club in the country so to do. This year's meeting (29th-31st May 2009) will mark our 75th meeting and the 61st documented dancing of the Horn Dance. Practices are held from 8.00pm to 10.00pm on Monday evenings in the Church Hall, Thaxted, during the period October to April and any man or boy wishing to join our club as dancer and/or musician will be most welcome. We dance out from May to September and this year’s programme marks our 81st consecutive year of dancing on bank holidays in Thaxted. The summer programme may be found here. The keeper of the archives would be most pleased to receive any pertinent material. 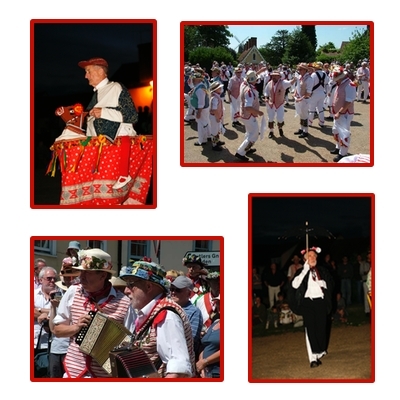 We have regular events from Easter Monday through to September every year including our superb weekend of dance which is Friday 2nd to Sunday 4th June this year with guest sides from all over the UK and further field. You can find details of all our events here.